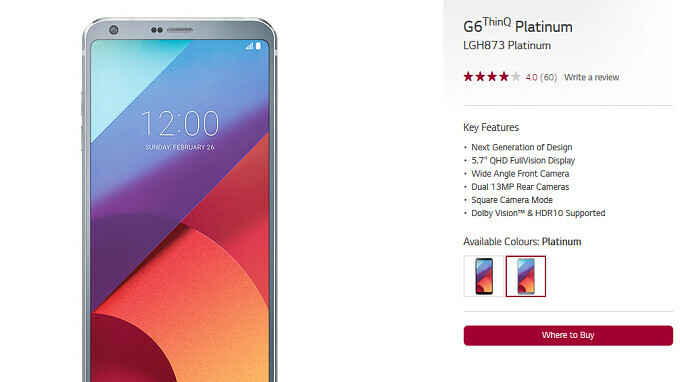 LG's online webstore in Canada shows that the company has started to rebrand the LG G6 as the LG G6 ThinQ. This is similar to the move it made with the LG V30 last month, as an OTA update changed the name of that handset to the LG V30 ThinQ. The update also added the AI CAM feature to the phone. The LG G6 ThinQ will include the same AI CAM feature, which analyzes the subject of a photo and suggests changes to the settings based on the lighting conditions and other variables. This allows the phone to produce improved photographs. The subject matter is also placed into different categories including "people, pets, food, flowers, city, landscape (sea/sky), sunset or sunrise." Those already sporting the LG G6 will receive an update that will make the name change and add the new features. While many think that the name is stupid and that LG should have just left well enough alone, others believe that the manufacturer can call its phone whatever name it wants as long as they receive the update that includes Artificial Intelligence features. It should be pointed out that at this point, only the LG Canada website shows the new moniker. That means that we are in the early days of the name change and update rollout. I get that we hate LG and they do dumb things but we need competition. We are lucky that LG flops are mainly PR related. Still, they do make solid hardware with OKish software support ;) Their PR guys need to ThinQ about their decisions. That ThinQ branding is just horrible.